Sorry, no time for a substantive post today. Dealing with a leak a section of my home’s sewer line that runs right under the platform the previous home owner built to hold the water heater. Thankfully, when water started pouring out of a failed joint last night, the LeakFrog I had placed in that area immediately brought the problem to our attention, allowing me to minimize the spread of water, and shut off the source. Even better, the parts to fix the problem cost me less than $15 at Home Depot. Score. Placing LeakFrogs around my house under sinks and next to the washer and water heater was one of the first things I did when I moved into my house. That is a decision I definitely do not regret. 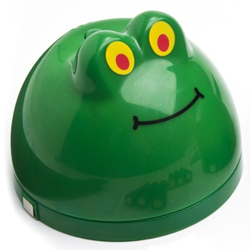 Whether you own your house or rent, it never hurts to have a few LeakFrogs around. I got mine at Woot a few years ago, but you can pick them up on Amazon for relatively cheap without waiting for them to reappear on Woot. Reader Question: Current Challenges for Sellers? Love this idea The Tim. I had never heard of Leak Frogs before. The only thing I can say is, if you have toddlers around the house, you’d better have those Frogs anchored down because they WILL get moved around. They’re just too darn cute. My kids would have them lined up for a good hose down. Ahhhhh the pleasures of home ownership are never ending…..
Frogs on drugs.. Look at those eyes- what exactly does this thing drink? RE: Scotsman @ 3 – High-octane P-trap water. I hear it is good stuff. RE: Scotsman @ 3 – With eyes like that it reminds me of Biliruben. I wonder whatever happened to him? I’m sure it’s a fine little gizmo, but it seems Tim didn’t realize just how skeezy it looks to put up a glowing, even RONCO-worthy blog testimonial for a household utility product available only via this special TV offer, er, only online, and for a limited time only! Act Now! You won’t find this in stores! First 100 customers get a free Acai Berry energy sampler! RE: Pegasus @ 2 – Yes, Tim, welcome to the “fun times” of home ownership. And I echo David’s comments about those frogs being serious kid magnets (you’ll find this out shortly ;). Just wait until you have finished living space in the basement – then you’ll really be paranoid about sewer issues! Three words: backflow prevention valve (I talked the owner of the house next door into getting one, that house will be coming onto the market soon). I can’t tell you how many times we had sewer backups into the basements of our rental units while I was growing up, usually caused by tree roots getting into the main line down the block a few houses. The city would unclog the line, but we would have to clean up the mess. Bleach is your friend! For those mentioning kids playing with them, keep in mind that I’ve got these in locations that kids don’t play: under sinks and in the laundry / water heater room. RE: robotslave @ 6 – Hey, laugh all you want, but it works and it saved me from a big mess. I just thought it was worth sharing. RE: ChrisM @ 8 -Kill-a-watt is particularly useful if you have an emergency generator. It won’t do surge, but it’s a lot more accurate at determining the running usage of devices than looking at web pages designed to sell larger generators. My refrigerator, for example, uses only about half what a typical web page would say. It’s a programmable light switch which you can program to go on or off X minutes before or after sunrise/sunset. So you can have a light come on at 10 minutes after sunset and off at 11:00 p.m. Much better than constantly having to adjust for sunset changes (or DST), and more flexible (and reliable) than an electric eye type device. I’m with ChrisM … eager to here others’ useful home gadgetry, especially gadgets that help on cost-savings or disaster prevention. A few years ago I bought a Mommy I’m Here proximity alarm and attached one end to my keychain and the other to my camera, so that I wouldn’t walk off without the camera. It was a good idea in theory but the radio issues too many false positives. Maybe someone has another brand they’ve used that works better? Usually these products are marketed as ways to keep from losing your kids at the mall, but they work for expensive electronics too. Re: Kill-A-Watt. Not sure about other appliances or generators, but the wattage ratings on PC power supplies are notoriously unreliable. The chip & GPU manufacturers always recommend a much higher wattage than you actually need because they don’t want you to overexert the PSU and blame the fancy new chip for the problem. If your PSU is made by a reliable parts manufacturer you can probably believe the wattage rating. RE: Kary L. Krismer @ 10 – Hey Kary, that is common for any AC motor. It may need 2-3 times its normal current draw in order to spin up. Once running it settles down. That is usually why you see the higher current ratings. An ounce of prevention is better than a ton of cure. I’m not talking about the start up surge. What I’m saying is that if you go to a page like this, it shows a refrigerator needs 500 watts running and 2000 surge. They want to sell larger generators. With the Kill-a-watt device you can pin down the running number, but not the surge. RE: Kary L. Krismer @ 14 – I don’t think it is to sell larger generators, I think it is to cover their butts since they can’t account for every model of appliance. They have no choice but to use a worst-case figure. RE: wreckingbull @ 15 – My refrigerator and furnace together don’t use 750 watts once running, but per that site it’s 1,350. Note that the Honda site underestimates my refrigerator, but perhaps it’s not energy star. My TV and computer together (I use an HD Homerun for TV) don’t take as much power as what they indicate for the TV alone (using either site). Don’t get me wrong–I believe in having a generator with sufficient reserve power. My regularly used items, including the garage door opener, total about 1750 watts (non-surge) and my generator is rated for 3000 w/ 3400 surge. AC induction motors can draw anywhere from 4-10 times their running current during startup, but only for a brief moment. When connected to the utility, this is normally not an issue. However, for a generator it is a huge issue, because the generator has to be able to deliver that high starting current, even if only for a moment. If it can’t, the motor either won’t start at all or will start very slowly, drawing as much current as it can get for a long time which is bad for the motor since it can overheat the windings and permanently damage the insulation. Take a 2-3kW generator and try to run a typical 120V circular saw on it. See how long it takes for the motor to spin up and you’ll see what I mean. So I have to disagree with the comment about the dealers just wanting to sell larger generators. If you have significant motor loads, your generator may have to be 2-3 times as big as is actually needed for the steady-state load. And you also have to keep in mind that the generator will usually be powering multiple loads, thereby reducing its capacity to start that additional motor load even moreso. For my surge numbers to exceed my generator by 300 watts I’d have to be running all my normal stuff (TV, stereo, computer, lights, gas fireplace fan) and have my furnace, refrigerator and garage door opener all start simultaneously. Also if I run non-normal stuff, (microwave or toaster, etc.) I’ll turn off the furnace. So the generator is basically almost always running at well less than 50% capacity. BTW, I’ve been planning on running the generator soon, so I’ll try that circular saw test. The “collapsed” sewer line seems to happen an awful lot in this part of the country. It almost seems like a right of passage for Seattle home owners (don’t know if the newer developments have similar problems) to end up with collapsed drains and then go through the hassle of scrounging for insurance coverage, or aid from the city to pay the $10,000 to $20,000 repair bills to dig up and replace the lines. Is it all the rainfall? Houses that weren’t built to last 75 years or more? The saw was fine, but I’d expect that with a 3000+ watt generator. I think it’s usually poor materials, although location plays a part (settling, tree roots, etc.). RE: John Bailo @ 19 – From my experience, it is older clay sewer lines that cause the vast majority of problems. RE: Kary L. Krismer @ 20 – I have always wished I had more generator power in my two portables, not less. Especially for a stationary standby generator, I don’t think you will ever regret buying more than you theoretically need. Another issue you will see when running long cables is voltage drop. Buy the meatiest extension cords you can to minimize this effect. I can recall times that switching to a better extension cord made the difference between a saw binding up or powering through. RE: wreckingbull @ 22 – Slightly different issue, but at our old house (built in the late 40s) the downspout drainage system was concrete pipe, about 4″ in diameter and 18″ in length, but they were just butted up against one another. There were no fittings connecting them together. Any settling at all and you’d have issues. Another use for the Kill-a-watt. It will let you know the voltage drop. What I did for cables was make my own, since I couldn’t find pre-made ones in the over-kill gauge I wanted, and also I needed a length between 25 and 50 feet, so I was able to hit it exactly. I went with the Insteon Smartlinc. It lets you manage switches/plugs in your home through a web UI. Does the same on/off at sunset thing (Which I love for my porch lights!) plus you can link switches together so you can do things like manage your garage lights from your living room (which is important when your garage is down 40 steps like mine is!). They also sell accessories that allow you to manage security systems, thermostats, remote cameras, sprinkler systems, get IMs/alerts for water leaks, check garage door status, etc. It’s not too expensive to get into, and you can buy stuff a little at a time as it suits your fancy. RE: Kary L. Krismer @ 24 – That is quite terrifying to think about. Really sounds like “meh, close enough”. About that same time they installed a sewer line from Ballard to Magnolia under the ship c.a.n.a.l. It was made of wood, and 77 years later, we are just now replacing it.